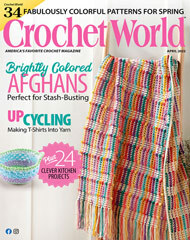 Have basic-level crochet and sewing skills? You can stitch this free crochet dress pattern for a girl. It's adorable! Trimmed with crocheted flowers and accented with polka dots, this happy little dress is easy to make. Start stitching the crochet bodice and fabric skirt today. You'll be amazed at how quickly it comes together. Size: Includes Newborn through 18 months. Made with size 10 crochet cotton and size 7/1.65mm steel hook.